The approximately 3,000 square foot (300sqm) rear patio and stairs of this Tucson residence had Stepstone, Inc. - Cal Arch Almond Pavers installed as part of a new build project. The owner requested the pavers were sealed with STAIN-PROOF Original™ per the manufacturer’s recommendations. This was done to protect the surface from efflorescence and future staining. 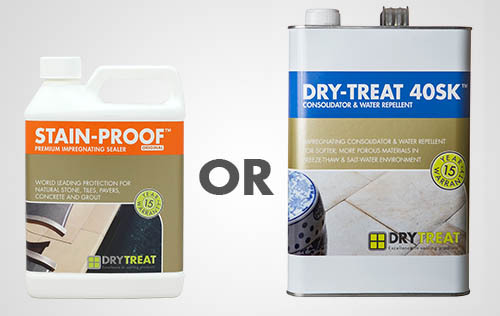 DRY-TREAT 40SK™ is a permanent water repellent and consolidator that strengthens softer, more porous materials by 30-40% and provides protection against problems caused by water ingress. Below is an image of the damaging effects that water ingress can have on your unprotected natural stone. STAIN-PROOF Original™ is an impregnating, invisible and breathable sealer that provides premium permanent protection from water and oil based stains as well as damage caused by water ingress. Since both are excellent permanent impregnating sealers, sometimes it is hard to know which one to use. Both are suitable for a wide variety of indoor and outdoor applications, including building facades, floors, walls, swimming pool surrounds, patios, garages, kitchens and public and private entertaining areas. Is the surface horizontal or vertical? Vertical surfaces do not require oil repellency because oil stains usually happen because of dropped food or leaf stains. DRY-TREAT 40SK™ is suitable for use on masonry surfaces such as brick, concrete, and Cultured Stone, also on softer more porous natural stone such as sandstone, limestone, and travertine. On horizontal surfaces, if you require the consolidation of DRY-TREAT 40SK™ as well as the oil repellency of STAIN-PROOF™ Original, it is recommended to apply STAIN-PROOF™ two weeks after the DRY-TREAT 40SK™. Please refer to the product section on our website for more details. What is the hardness of the material? What type of pool system is involved? For softer, more porous materials around saltwater pool, it is recommended to use DRY-TREAT 40SK™ for consolidation and permanent water repellence. In most cases, dip sealing the coping will be necessary. If the area will be used for a lot of entertaining, apply STAIN-PROOF™ Original two weeks after DRY-TREAT 40SK™ for added oil repellence. 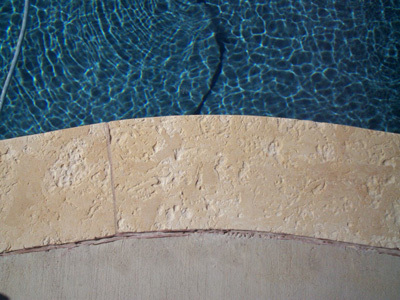 STAIN-PROOF™ Original is recommended for other materials in saltwater or chlorine pools. What is the surrounding environment? View the full product descriptions of STAIN-PROOF™ Original and DRY-TREAT 40SK™. 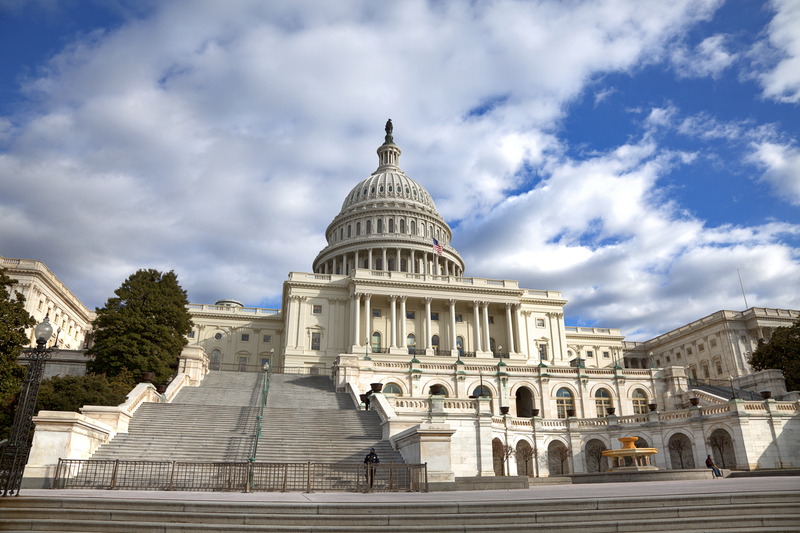 Two major United States landmarks are the U.S Capitol and the White House, both of which are made from the same unique stone. The stone used was actually chosen by George Washington himself and comes from the Aquia Creek quarry, now called the Government Island Park and Historic Quarry in Stafford County, Virginia. According to the United States Geological Survey (USGS), this stone is also referred to as freestone and was a very popular building material in the early 19th century being used in many of Washington D.C.’s most famous government buildings. Unfortunately, the freestone was not very resilient to weathering and it soon “became apparent to architects of the day that it would be better not to use Aquia Creek sandstone in constructing buildings of the capital city”. 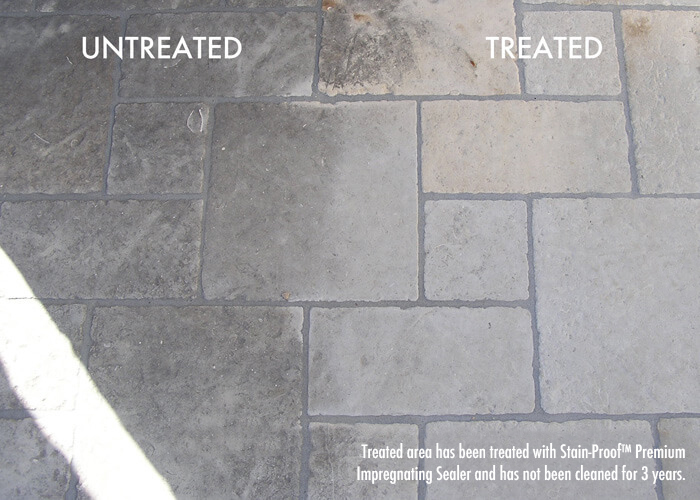 Perhaps if they had used DRY-TREAT 40SK™ the stone wouldn’t have suffered problems caused by water and water born salts. Visit the Government Island Park and Historic Quarry.